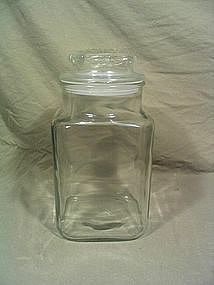 Vintage 64 ounce apothecary style canister marked with an anchor. No chips, cracks, breaks or rough rims. The interior plastic gasket on the lid is secure with no drying or discoloration. There are some small superficial use scratches. 2 of these canisters are available. I need your zip code to calculate the postage.